A speaker is a sound device used to convert electric sound signals into audible sound waves by the vibration of a vibration plate. 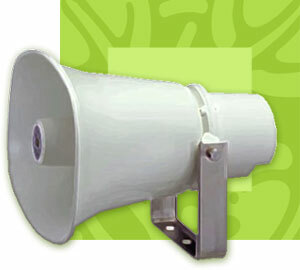 It is of two types: direct spreading type speaker and horn speaker. A horn speaker is a speaker in which a vibration plate is placed in the interior of a horn. The horn helps increase the efficiency of the speaker. The portion of the cone beside the speaker cone driver is the ‘throat’ and the portion farthest to the speaker cone is the ‘mouth’. With a gradual increase in the cross section area of the horn, the speaker converts the high pressure variations with small displacements into low pressure variations with large displacement and the other way around too. These speakers come in a variety of horn designs, varying in length, material, taper and also in the different types of drivers. They can be lightweight and rigid, therefore exempting the need for costly materials of construction. Very small drivers can be used in place of large ones used in other speakers to get the same effect. The speaker horn is one of the most efficient speakers and is used for audio reproduction and to create harmonic resonances. It's ability to create high sound pressure levels makes it very popular for public addressing programs. In musical concerts many horn speakers are used to provide the required high volume bass reproduction. If the vibration plate is vibrated by a piezo-electric element it’s called a piezo-electric horn speaker and when vibrated by a voice coil vibrating by an electromagnetic force it’s called a dynamic type horn speaker. Find a selection of horn speakers at www.TWAcomm.com!